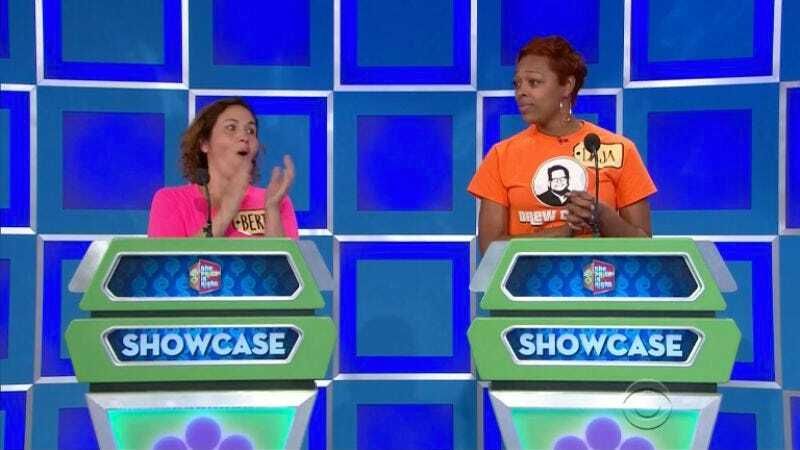 A pair of contestants try to keep their composure as they are presented with a dazzling array of prizes during The Price Is Right's Showcase round (not the Showcase Showdown). In a Great Job, Internet! post last week, I alerted readers to a shocking injustice perpetrated by The New York Times against game show fans, pop culture nitpickers, and all those who rally to the cause of truth. To recap: In the latest installment of its consumer-advocate column “The Haggler,” the Times helped a woman who was waiting to receive prizes she’d won on The Price Is Right. David Segal, who writes the Haggler column, indicated that the aggrieved party had won her prizes in Price’s Showcase Showdown round. That was incorrect. In fact, the contestant won the lion’s share of her prizes in the climactic Showcase round—the Showcase Showdown is when players spin a big, colorful wheel for a chance to participate in the Showcase. Confusing the Showcase with the Showcase Showdown is a common mistake but a mistake nonetheless. After a tweet to Segal about the error failed to get results, I turned to A.V. Club readers, inviting them to email the Times and request a correction, politely. Nobody wanted to make life difficult for Segal, who writes a splendid, amusing, and helpful column. But many of you concurred with me that the Showcase Showdown mistake threatened to unravel the very fabric of public discourse, at least as it pertains to daytime TV shows with wheels that go “boop boop boop.” Many of you also agreed that it would be fun to make the proud, mighty Times confront the minutiae of a program that lavishly rewards people for knowing about how much a can of green beans costs. An article last Sunday about Allison McKay, a contestant on “The Price Is Right” who had not received her prizes, misstated how she won. Most of the merchandise was won in the Showcase section of the program, not the Showcase Showdown. The error was repeated in the headline. Indeed, the column’s original headline read “A ‘Price Is Right’ Winner Let Down By A Showcase Showdown,” and the corrected version reads, “A ‘Price Is Right’ Winner’s Showcase Letdown,” which is both more accurate and a superior play on words. The Times editors didn’t just fix the mistake; they did so with style. And so, thanks to the stalwart A.V. Club readership, the forces of chaos and confusion in game show journalism have been once again banished to their dark hives. Granted, this may be a temporary victory. Our hard-fought triumph may very well be reversed the next time, say, a news outlet mentions Jeopardy! host “Alec Trebek” or tells the story of a contestant who won big in Family Feud’s “Cash Money” round. But until then, let’s savor our win. Thanks to our efforts, readers of The New York Times now know that the final round of The Price Is Right is called the Showcase. Except for the stock market and ISIS, the world is a better place today, and it’s all because of us.